For the spider genus, see Arachosia (spider). Eastern territories of the Achaemenid Empire, including Arachosia. Arachosian soldier of the Achaemenid army, circa 470 BCE, Xerxes I tomb. Arachosia /ærəˈkoʊsiə/ is the Hellenized name of an ancient satrapy in the eastern part of the Achaemenid, Seleucid, Parthian, Greco-Bactrian, and Indo-Scythian empires. Arachosia was centred on the Arghandab valley in modern-day southern Afghanistan, although its influence extended east to as far as the Indus River. The main river of Arachosia was called Arachōtós, now known as the Arghandab River, a tributary of the Helmand River. The Greek term "Arachosia" corresponds to the Aryan land of Harauti which was around modern-day Helmand. The Arachosian capital or metropolis was called Alexandria Arachosia or Alexandropolis and lay in what is today Kandahar in Afghanistan. Arachosia was a part of the region of ancient Ariana. The ancient Arachosia and the Pactyan people during 500 BC. "Arachosia" is the Latinized form of Greek Ἀραχωσία - Arachōsíā. "The same region appears in the Avestan Vidēvdāt (1.12) under the indigenous dialect form Haraxvaitī- (whose -axva- is typical non-Avestan)." In Old Persian inscriptions, the region is referred to as 𐏃𐎼𐎢𐎺𐎫𐎡𐏁, written h(a)-r(a)-u-v(a)-t-i. This form is the "etymological equivalent" of Vedic Sanskrit Sarasvatī-, the name of a river literally meaning "rich in waters/lakes" and derived from sáras- "lake, pond." (cf. Aredvi Sura Anahita). "Arachosia" was named after the name of a river that runs through it, in Greek Arachōtós, today known as the Arghandab, a left bank tributary of the Helmand. Arachosia bordered Drangiana to the west, Paropamisadae (i.e. Gandahara) to the north, a part of ancient present day Pakistan to the east, and Gedrosia (or Dexendrusi) to the south. Isidore and Ptolemy (6.20.4-5) each provide a list of cities in Arachosia, among them (yet another) Alexandria, which lay on the river Arachotus. This city is frequently mis-identified with present-day Kandahar in Afghanistan, the name of which was thought to be derived (via "Iskanderiya") from "Alexandria", reflecting a connection to Alexander the Great's visit to the city on his campaign towards India. But a recent discovery of an inscription on a clay tablet has provided proof that 'Kandahar' was already a city that traded actively with Persia well before Alexander's time. Isidore, Strabo (11.8.9) and Pliny (6.61) also refer to the city as "metropolis of Arachosia." In his list, Ptolemy also refers to a city named Arachotus (English: Arachote /ˈærəkoʊt/; Greek: Ἀραχωτός) or Arachoti (acc. to Strabo), which was the earlier capital of the land. Pliny the Elder and Stephen of Byzantium mention that its original name was Cophen (Κωφήν). Hsuan Tsang refers to the name as Kaofu. This city is identified today with Arghandab which lies northwest of present-day Kandahar. The inhabitants of Arachosia were Iranian peoples, referred to as Arachosians or Arachoti. It is assumed that they were called Paktyans by ethnicity, and that name may have been in reference to the ethnic Pa���tun (Pashtun) tribes. "Beyond is Arachosia. And the Parthians call this White India; there are the city of Biyt and the city of Pharsana and the city of Chorochoad and the city of Demetrias; then Alexandropolis, the metropolis of Arachosia; it is Greek, and by it flows the river Arachotus. As far as this place the land is under the rule of the Parthians." Ptolemy (6.20.3) mentions several tribes of Arachosia by name, the Pargyetae (Greek: Παρ(γ)υῆται), and, to the south, the Sidri (Greek: Σίδροι), Rhoplutae (Ῥωπλοῦται), and Eoritae (Ἐωρῖται). Despite attempts to connect the Eoritae with the "Arattas" of the Mahabharata or with present-day Aroras, who populated this land and migrated to India after partition, the identity of these tribes is unknown, and even Ptolemy's orthography is disputed ("Pargyetae" is sometimes rewritten "Parsyetae" or "Aparytae"). 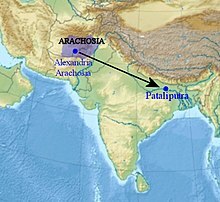 According to Arrian, Megasthenes lived in Arachosia and travelled to Pataliputra, to the court of Chandragupta Maurya. The region is first referred to in the Achaemenid-era Elamite Persepolis fortification tablets. It appears again in the Old Persian, Akkadian and Aramaic inscriptions of Darius I and Xerxes I among lists of subject peoples and countries. It is subsequently also identified as the source of the ivory used in Darius' palace at Susa. In the Behistun inscription (DB 3.54-76), the King recounts that a Persian was thrice defeated by the Achaemenid governor of Arachosia, Vivana, who so ensured that the province remained under Darius' control. It has been suggested that this "strategically unintelligible engagement" was ventured by the rebel because "there were close relations between Persia and Arachosia concerning the Zoroastrian faith." Alexander the Great in Arachosia, 329 BCE. 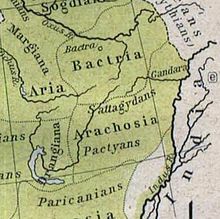 The chronologically next reference to Arachosia comes from the Greeks and Romans, who record that under Darius III the Arachosians and Drangians were under the command of a governor who, together with the army of the Bactrian governor, contrived a plot of the Arachosians against Alexander (Curtius Rufus 8.13.3). Following Alexander's conquest of the Achaemenids, the Macedonian appointed his generals as governors (Arrian 3.28.1, 5.6.2; Curtius Rufus 7.3.5; Plutarch, Eumenes 19.3; Polyaenus 4.6.15; Diodorus 18.3.3; Orosius 3.23.1 3; Justin 13.4.22). Following the Partition of Babylon, the region became part of the Seleucid Empire, which traded it to the Mauryan Empire in 305 BCE as part of an alliance. The Shunga dynasty overthrew the Mauryans in 185 BC, but shortly afterwards lost Arachosia to the Greco-Bactrian Kingdom. It then became part of the break-away Indo-Greek Kingdom in the mid 2nd century BCE. Indo-Scythians expelled the Indo-Greeks by the mid 1st century BCE, but lost the region to the Arsacids and Indo-Parthians. At what time (and in what form) Parthian rule over Arachosia was reestablished cannot be determined with any authenticity. From Isidore 19 it is certain that a part (perhaps only a little) of the region was under Arsacid rule in the 1st century CE, and that the Parthians called it Indikē Leukē, "White India." The Kushans captured Arachosia from the Indo-Parthians and ruled the region until around 230 CE, when they were defeated by the Sassanids, the second Persian Empire, after which the Kushans were replaced by Sassanid vassals known as the Kushanshas or Indo-Sassanids. In 420 CE the Kushanshas were driven out of present Afghanistan by the Chionites, who established the Kidarite Kingdom. The Kidarites were replaced in the 460s CE by the Hephthalites, who were defeated in 565 CE by a coalition of Persian and Turkish armies. Arachosia became part of the surviving Kushano-Hephthalite Kingdoms of Kapisa, then Kabul, before coming under attack from the Moslem Arabs. These kingdoms were at first vassals of Sassanids. Around 870 CE the Kushano-Hephthalites (aka Turkshahi Dynasty) was replaced by the Hindu Shahi dynasty, which fell to the Muslim Turkish Ghaznavids in the early 11th century CE. Arab geographers referred to the region (or parts of it) as 'Arokhaj', 'Rokhaj', 'Rohkaj' or simply 'Roh'. Arachosia retained Zoroastrian religious and cultural influence until the advent of Islam in the 7th century. Much of the country remained Zoroastrian even while in Arab hands, but within a few centuries Islam became the region's dominant religion. See Sistan for information on the religion of the area after the Arab conquest. The theory of Croatian origin traces the origin of the Croats to the area of Arachosia. This connection was at first drawn due to the similarity of Croatian (Croatia - Croatian: Hrvatska, Croats - Croatian: Hrvati / Čakavian dialect: Harvati / Kajkavian dialect: Horvati) and Arachosian name, but other researches indicate that there are also linguistic, cultural, agrobiological and genetic ties. Since Croatia became an independent state in 1991, the Iranian theory gained more popularity, and many scientific papers and books have been published. ^ a b c d e f g h Schmitt, Rüdiger (August 10, 2011). "Arachosia". United States: Encyclopædia Iranica. ^ Lendering, Jona. "Alexandria in Arachosia". Amsterdam: livius.org . ^ Houtsma, Martijn Theodoor (1987). E.J. Brill's first encyclopaedia of Islam, 1913-1936. 2. BRILL. p. 150. ISBN 90-04-08265-4. Retrieved 2010-09-24. ^ Kalyanaraman, Srinivasan. "Sarasvati Civilization Volume 1". Bangalore: Babasaheb (Umakanta Keshav) Apte Smarak Samiti . ^ Budimir/Rac, Stipan/Mladen. "Anthropogenic and agrobiological arguments of the scientific origin of Croats". Zagreb: Staroiransko podrijetlo Hrvata : zbornik simpozija / Lovrić, Andrija-Željko (ed). - Teheran : Iranian Cultural Center . ^ Dvornik 1956: "The Slavs. Their Early History and Civilization." by F. Dvornik, American Academy of Arts and Sciences, Boston, USA., 1956. ^ Sakac 1949: "Iranisehe Herkunft des kroatischen Volksnamens", ("Iranian origin of the Croatian Ethnonym") S. Sakac, Orientalia Christiana Periodica. XV (1949), 813-340. ^ Vernadsky 1952: "Der sarmatische Hintergrund der germanischen Voelkerwanderung," (Sarmatian background of the Germanic Migrations), G. Vernadsky, Saeculum, II (1952), 340-347.